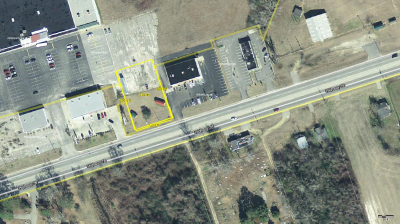 Vacant commercial lot, situated between O'Reilly's Auto Parts and Advance Auto Parts retail stores, including readily available water & sewer service; lot is part of a larger 6.47 acre parcel with additional portions available, if needed. Excellent US Hwy 76 visibility, frontage, and access. Located between Wal-Mart and the downtown business district; high local and US Hwy traffic. Ideal retail or office professional site. Subject to survey, maybe slightly more frontage; approximately 0.54 acre lot.